June Hee Kwon (New York University) communicates with students about writing issues at the mentoring workshop. Tianyu Xie. 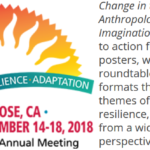 Continuing the practice of connecting members at all career stages—graduate students as well as junior and senior scholars—SEAA held several workshops at the 2017 AAA Meeting. The section’s student councilors Tianyu Xie, Jing Wang, and Yukun Zeng, organized a mentoring workshop on proposal writing and grant applications for early-career scholars and graduate students and an informal graduate student dinner. 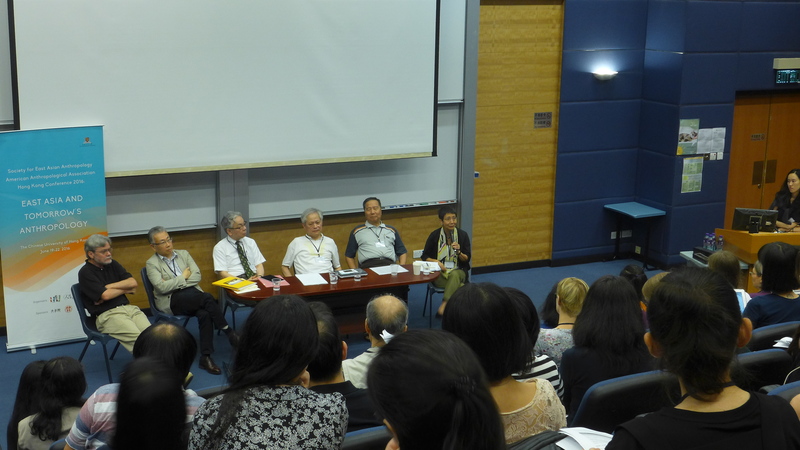 SEAA also hosted a workshop on “Publishing Your First Book,” organized by Priscilla Song, where panelists—most of whom have recently published Asia-related monographs—spoke about and worked with participants on topics such as the process of transforming the dissertation into a book and the review process. 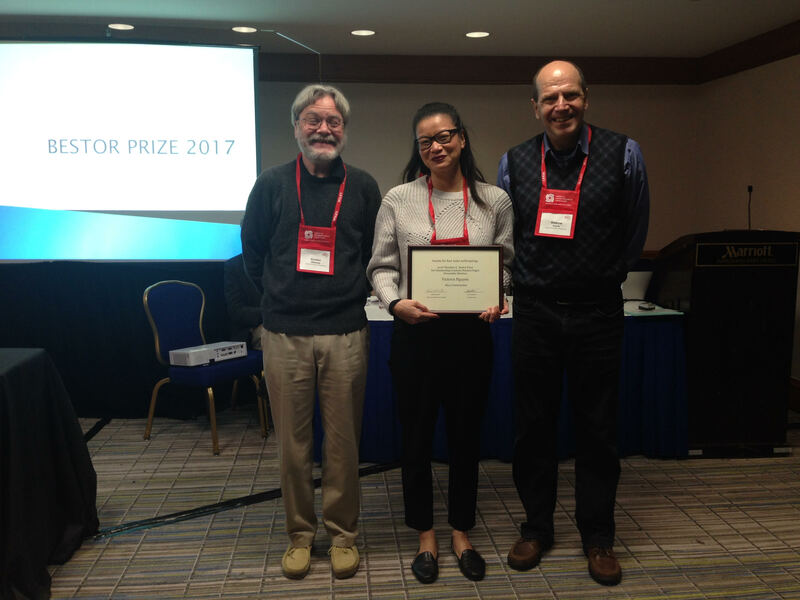 2017 Hsu Prize Winner Yukiko Koga with outgoing SEAA President Gordon Mathews and Hsu Prize Committee Chair Jie Yang. Jing Wang. 2017 Bestor Prize recipient Gil Hizi with outgoing SEAA President Gordon Mathews and incoming President Glenda Roberts. Jing Wang. Victoria Nguyen, 2017 Bestor Prize Honorable Mention recipient with outgoing SEAA President Gordon Mathews and Bestor Prize Committee member Andrew Kipnis. Jing Wang. 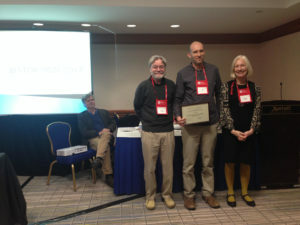 Several SEAA members also celebrated their publications in print at the university press booths stationed at the AAA Meeting. 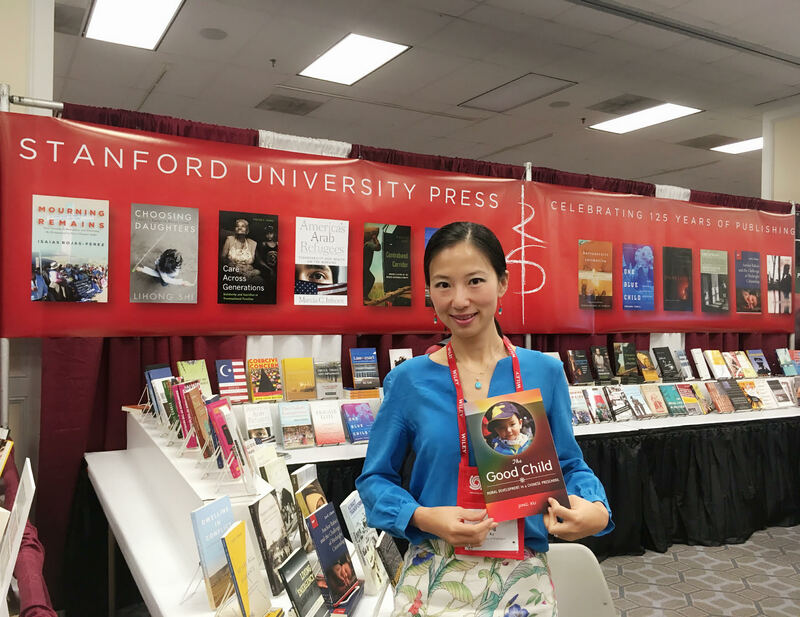 Jing Xu (University of Washington) with her book The Good Child: Moral Development in a Chinese Preschool (2017) at the Stanford University Press booth. Jing Xu. 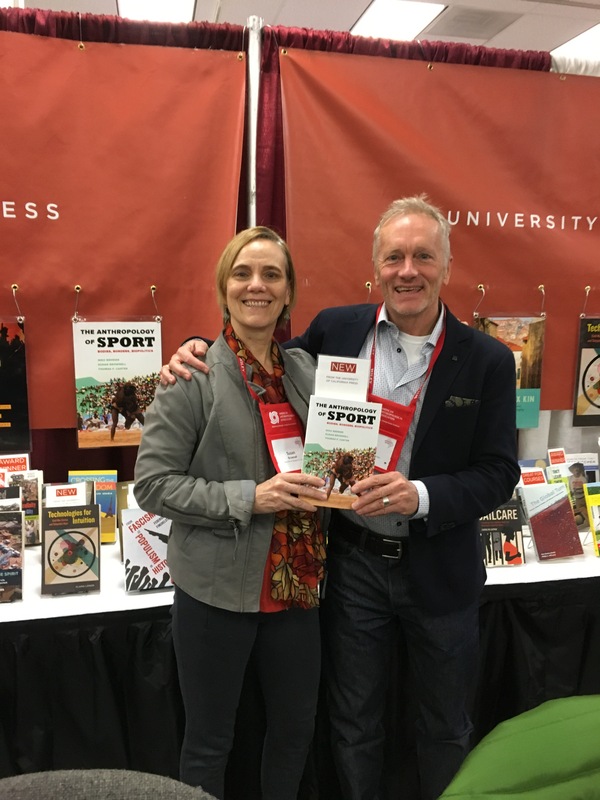 Susan Brownell (University of Missouri-St. Louis) and Niko Besnier (University of Amsterdam) next to the poster for their co-authored book (with Thomas F. Carter, University of Brighton) The Anthropology of Sport: Bodies, Borders, Biopolitics (2017) at the University of California Press booth. Susan Brownell. Heidi K. Lam is a PhD candidate in anthropology at Yale University and a contributing editor for the SEAA section news column. She is writing her dissertation on commercial historically-themed experiences in Japan and their impact on tourism, the performing arts, and affective labor in the Japanese culture industries. Over the next six weeks, several professional missionaries and around twenty students (myself included) met to train in IT missions at the school. We discussed how Korean Christians might use information technologies to evangelize and to “fight ISIS,” whom in 2015 the participants saw as winning the “spiritual war” (chŏng-sin-ŭi chŏn-chaeng) being waged through social media. Sessions included lectures by religious leaders and small group projects to develop and/or use mission technologies, intermingled with worship and prayer. The lectures framed the IT Missions School—and South Korean Christianity—within a particular global history of technological progression. IT missions were deemed the appropriate response to the “new paradigm” (sae-lo-un p’ae-lŏ-ta-im) that accompanied the “IT age” (IT si-tae). The lectures detailed the “IT infrastructures God had built” (ha-na-nim-ŭn IT in-p’ŭ-la-lŭl ku-ch’uk-ha-syŏss-sŭp-ni-ta) to equip Christian missions throughout history, culminating in discussions of the media technologies the leaders were currently developing. Drawing upon Max Weber’s famous thesis of the elective affinity between Protestantism and rational capitalist development, these lectures argued that South Korean Christians had a unique calling to become IT missionaries. Weber, they said, demonstrated the close relationship between Protestantism and industrialization as they developed in Europe and North America. The historical coincidence of technological innovation at Korean conglomerates like Samsung and LG and the late growth of Protestantism in Korea (now the world’s foremost missionary-sending nation) signaled that “It’s Korea’s time,” as Loren Cunningham of Youth with a Mission (YWAM) announces in one IT Mission School video. In this context, the lectures communicated that the fate of both the nation’s tech industry and global Christendom depended upon South Korean Christians embracing the marriage of Christianity and technological invention. Two leathery hands cradle a smart phone whose screen, like the hands themselves, is cracked. On the phone appears the image of a smiling Jesus Christ amidst a throng of disciples. 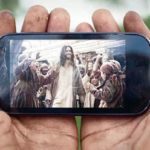 This picture appears in a video advertisement for “Smart Bible,” an IT missions project that uploads Christian media onto donated smart phones such that short-term missionaries can leave these devices with people in their mission field. FMnC. The unique place of Korean technology missionaries in the world was reinforced repeatedly, for example, through the project leader’s slogan for such work: “CLICK & TOUCH: Through the IT God put in our hands, click and touch the whole world” (CLICK & TOUCH: han-na-nim son-e put’ tŭl-lin IT-on se-sang-ŭl k’ŭl-lik-ha-ko t’ŏ-ch’i-ha-ta). Repeatedly, our leader prayed that God would inspire projects to transform cyberspace into the Kingdom of God, particularly in this period when, he argued, ISIS was successfully bending cyberspace in their own spiritual direction. At once a plea to God and a motivational speech to his team, his prayers advanced a vision of cyberspace allowing IT missionaries to do the kind of missionary work befitting God’s omnipresence—wherever, whenever, with whomever (ŏn-che-na, ŏ-ti-na, nu-ku-na). 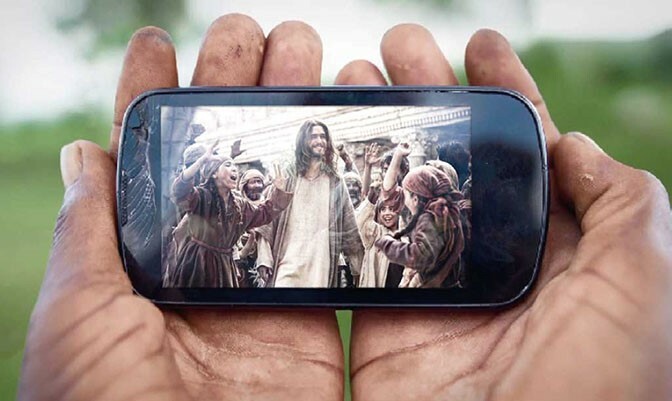 IT missionaries place their hands on donated smart phones, praying that God would touch people through the use of these devices. FMnC. In a theological tradition in which hands and the sense of touch figure prominently in spiritual transmission and healing, the technologies that mediate religious practices come to mimic or take on the qualities formerly attributed to human hands. Large screens in telecasting churches are said to “embrace” (an-a chu-ta) congregations, wrapping around sanctuaries like the outstretched hands of a pastor giving a benediction. Many charismatic Korean pastors became famous for their ability to heal through laying hands on the sick, and now those same pastors are understood to heal through the broadcasts of their sermons. The ability for apparently distant or disembodied sociality to “touch” is emphasized, in slogans such as “Click and Touch” and “I.T.ouch.U.” In the words of one pastor featured in the IT missions promotional videos, “God will serve the coming world with Korean technology, and we should want to become the hands of God.” The idea that technologies alienate is well-rehearsed, as is the idea that social media use creates as much social distance as it presumes to overcome. But in these Korean Christian communities, the “digit” of “digital technology” is clear and unironic, reconfiguring at once the perceived role of South Korea in the global course of Christian history and how souls might feel a spiritual touch with each click from an IT missionary’s hand. Heather Mellquist Lehto is a PhD candidate in sociocultural anthropology at UC Berkeley, with a master’s of theological studies from Harvard Divinity School. Her dissertation explores technology in religious practice through ethnographic research at transnational churches in South Korea and the United States. Cite as: Mellquist Lehto, Heather. 2017. “Click and Touch.” Anthropology News website, November 15, 2017. In 2008 a small group of Chinese business owners gathered together to propose the official declaration of a new Chinatown in Tokyo. Ikebukuro, the second busiest station in the Northwestern corner of Tokyo’s central loop-line, had attracted growing numbers of Chinese students and entrepreneurs in the preceding decades, and in the eyes of some had already become a Chinatown of sorts. The proposal was touted as a means of rebranding already existing networks of Chinese businesses in the area, hoping to mirror the success of historic Chinatowns in Japan, such as in Yokohama and Kobe. Ikebukuro’s Chinatown designation was intended to represent the new overseas Chinese community in Japan. Migrants from the People’s Republic of China grew to become the largest non-Japanese minority in Japan in 2006, and are mostly made up of those who followed education-oriented pathways into the country after 1985. From student-workers and trainees, the earlier generation of this migrant group have since established themselves as independent business-owners and/or employees in Japanese companies and public institutions. The majority however, are relatively young with fluid identities, diverse interests, and quickly changing ambitions. The northern corner of Ikebukuro hosts over 300 Chinese-owned businesses and its municipal district (Toshima ward) is home to more than 13,000 Chinese nationals. More significantly, the station connects to many wider networks of Chinese sociality in the city. The official government response to the Chinatown proposal was that the Chinese community was too new, and too disengaged from local Japanese organizational activities to warrant official recognition. The phrase ‘let’s start from a dialogue’ (mazu kōryu kara) was repeated in various media reports at the time, exemplar of the polite yet distinctly conclusive way Japanese institutions reject these sorts of proposal. 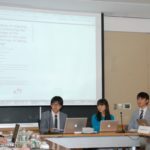 Unable to gain official approval, several of the initial proponents of the Chinatown proposal side-stepped Japanese stakeholders by producing a ‘Tokyo Chinatown’ website that links to various social media. In turn, Ikebukuro’s unofficial Chinatown status has been supported by some Japanese scholars and activists, serving as a symbol of new urban diversity in Japan. From these accounts one might assume that the Chinatown proposal reflects a newly forming Chinese community in Ikebukuro, as well as its tense relationship with local Japanese officials. 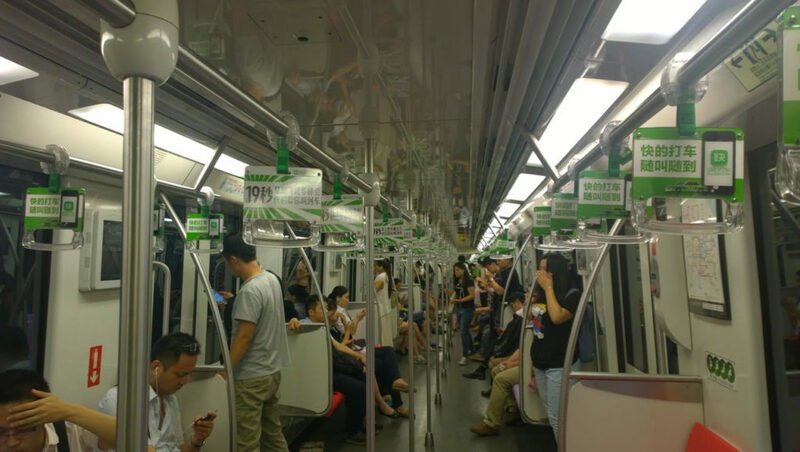 However, the growth in digital forms of sociality and their intersection with new mobilities has ensured that many Chinese community-forming practices in Tokyo have taken on less territory oriented dynamics. 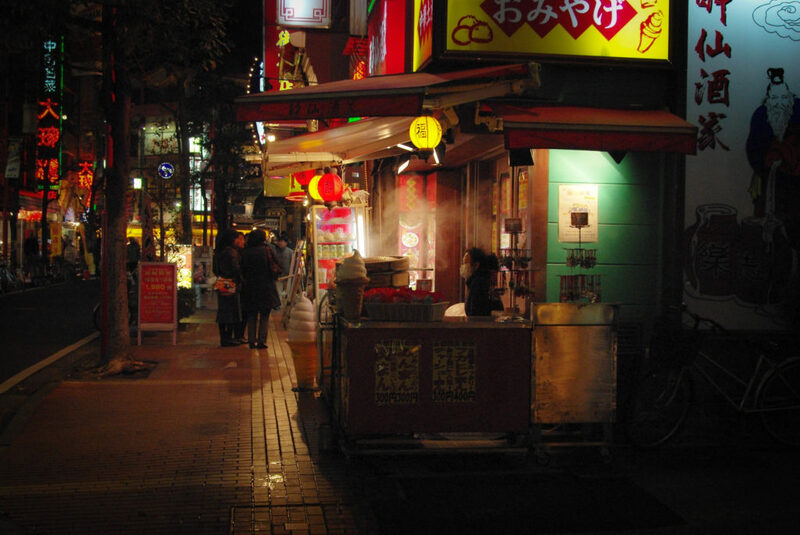 Based on fieldwork in Ikebukuro, the Chinatown proposal by no means reflected the patterns of sociality and identification among the majority of ethnic Chinese in Tokyo, nor Ikebukuro. 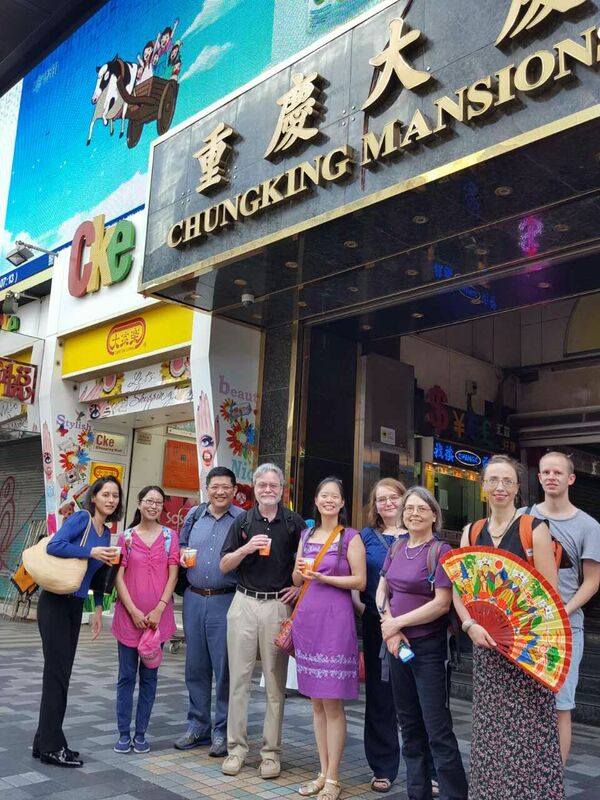 In fact, the Chinatown’s rejection was met with sighs of relief among many of Ikebukuro’s circles, with people stating that Chinatowns are an older form of sociality no longer fitting the way Tokyo’s relatively new Chinese population want to live their lives. One young woman from Shijiazhuang told me that Chinatowns do not reflect how her peers imagine places such as Ikebukuro. She continued, stating the Chinatown and its accompanying website and ideals, for instance, were ‘dead’ (si). 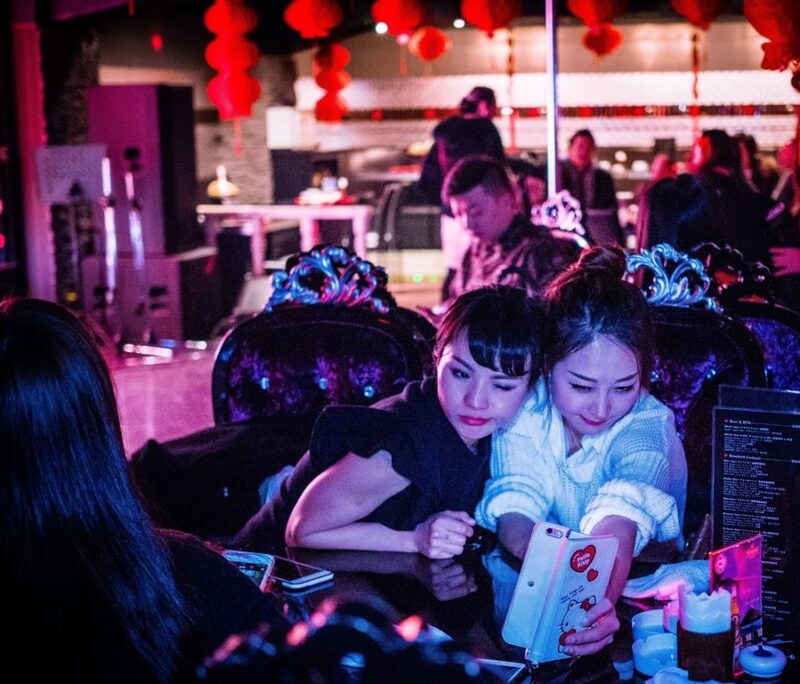 In contrast, the intersection of smartphones and social media has ensured that Chinese sociality intersects with wider patterns of otherness in Tokyo. One young man from Nanjing, for instance, even jokingly said to me ‘Tokyo’s Chinatown is online (wangshang)’. While Tokyo’s Chinatown may be ‘online’, it does not follow patterns of strict co-ethnic identification, nor was it disconnected from analogue spaces in the city. 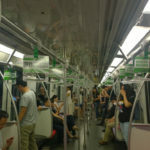 Rather than connecting to a single ethnic enclave, digital Chinese sociality in Tokyo connects multiple Sinophone social media platforms to a heterotopic spread of bars, restaurants, social clubs, churches, schools, and various other spaces tucked away within the urban spread of the city. Some of these spaces were clustered around major stations such as Ikebukuro, Shinjuku and Ueno, but this was not always the case. Moreover, this kind of spatial arrangement suggested less about Chinese social life in the city than it did the ways the relationship between digital and analogue life intersects with Tokyo’s already heterotopic qualities. The choice of platform in negotiating these many connections and places reflects the differing scaling effects of digital sociality. These scales cut across extant associations between ethnicity and place in Tokyo, following logics of conviviality and practice more so than ethnic identification. At the same time, the conviviality of shared meanings, particularly in terms of joking, ensured that certain social media platforms had aggregating effects. WeChat, for example, was decidedly Sinophone, whereas platforms such as Facebook and Twitter (which are technically banned in mainland China), were used to navigate multi-lingual networks of practice in Tokyo, such as fan groups, artist collectives and nightlife based friendships. 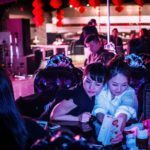 Private WeChat groups such as one titled ‘the mental asylum’, which I followed during fieldwork from 2014-2016 were born out of chance encounters in bars across Tokyo, and became a site for the circulation of private images that parody Chinese pop culture, as well as complex Sinophone language games. 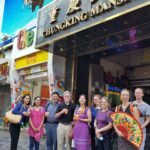 Others, such as a group of Chinese-speaking artists, musicians and documentarians formed out of shared interests and eventually became an inclusive space for Chinese-speaking people from around the world, including me. These groups were spaces of constant chatter, and frequently turned into face-to-face meetings throughout the city to sing karaoke and eat Chinese food. Chinatowns in Japan, much like in other parts of the world, have stood as a curious means of territorializing ethnic groups in the city. Yokohama’s Chinatown emerged out of legal restrictions on the occupations and spaces Chinese workers could enter in the late nineteenth and early twentieth century. From the 1980s it was refurbished and reinvented to become a place where ethnic Others were celebrated as consumable and desirable. However, the new Chinatowns of Tokyo appear to differ. From the legal, to the cultural and political, the spatial dynamics of Chineseness and otherness in Japanese cities has taken on new patterns in recent years. Enabled by digitalized sociality, the young Chinese population in Tokyo reflects a diversity that is nowhere but everywhere, aggregated in terms of practice and shared interest, and resistant to the demarcation of ethnic enclaves, such as those embodied in the term ‘Chinatown’. Jamie Coates works on Sino-Japanese mobilities and their effect on young Chinese identities. In particular, he is interested in how migration, media, and play shape young Chinese efforts to re-imagine co-ethnic and regional ideas of commonality. He is currently a visiting fellow at Sophia University. Of all of the data that has inundated us during this digital revolution, from the flow of images and texts to tweets and links, we have also experienced a loss in our attention to the human voice in narrative. Perhaps this became especially acute for me in the aftermath of the March 11th, 2011 triple disasters in Japan. 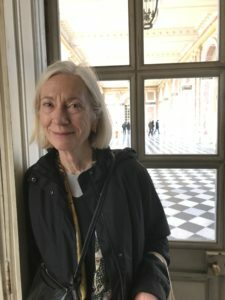 Because of the disruption of time and place, of life course and communities, oral narrative has emerged as a privileged way to understand and share this condition within and beyond the affected communities. Digital media has also, somewhat paradoxically, allowed voice and face, those most analogue elements of data, to be gathered and made accessible in ways that were not before possible. 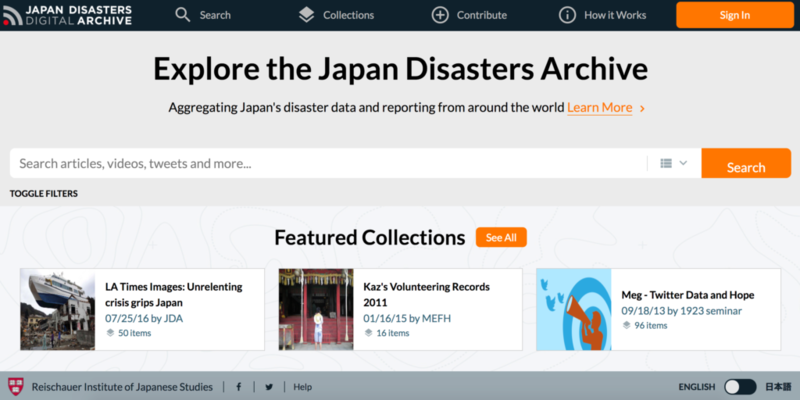 In “Voices from Tohoku” we have collected our own interviews into the largest archive of video oral narratives on the 3.11 disasters, and one of the largest oral narrative projects on any topic. 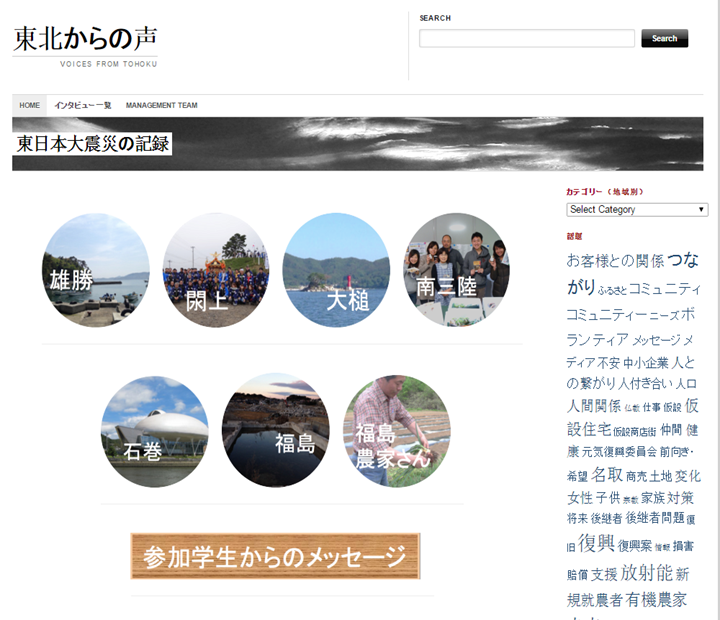 The archive is the work of students at Sophia University who have conducted more than 500 hours of semi-structured interviews throughout Iwate, Miyagi and Fukushima prefectures from the spring of 2011 until 2015 (when we ran out of money). Thus, unlike some other projects which are primarily portal sites that link to and aggregate other data, our archive contains only the data we have generated ourselves. Our videos are people telling their own story in their own words. 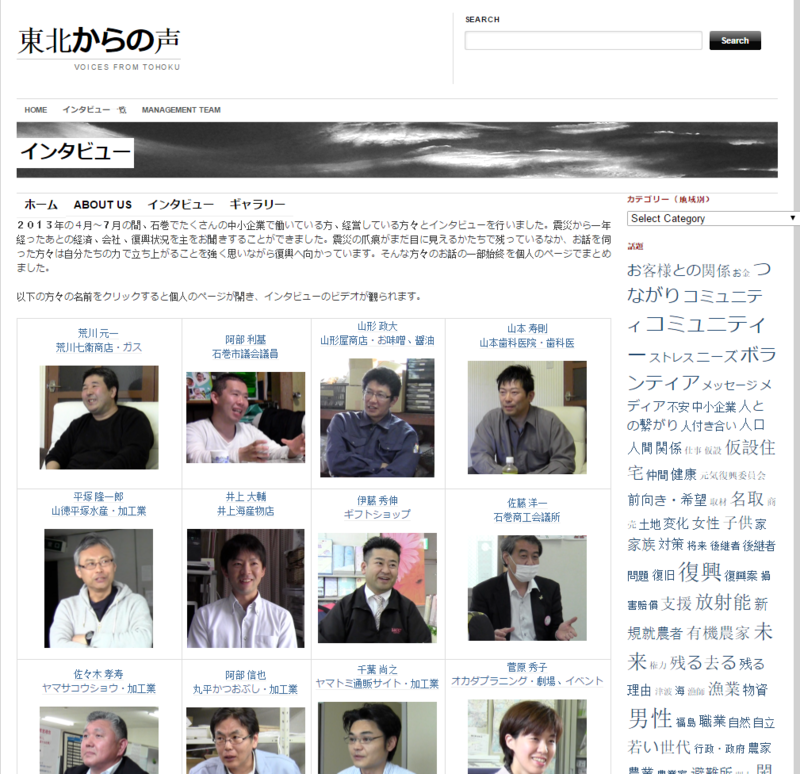 Most interviews are between 1 and 2 hours long, and the full scholarly archive contains all of these unedited digital videos, almost completely transcribed and thus searchable, which we have made accessible to scholars from Japan, Asia, Europe and North America. There is also an open “community” website with thousands of shorter clips of 1-3 minutes. These clips are geographically and thematically tagged. The website has more than 80,000 hits now—which in the world of oral narrative are rock-star numbers. Our site is plain without impressive graphics and only basic coding. Because it is designed primarily as a way for us to share our interviews with our narrators in Tohoku, it is only in Japanese now (but Google Translate can give you a rough idea). We did not start as a research project at all. 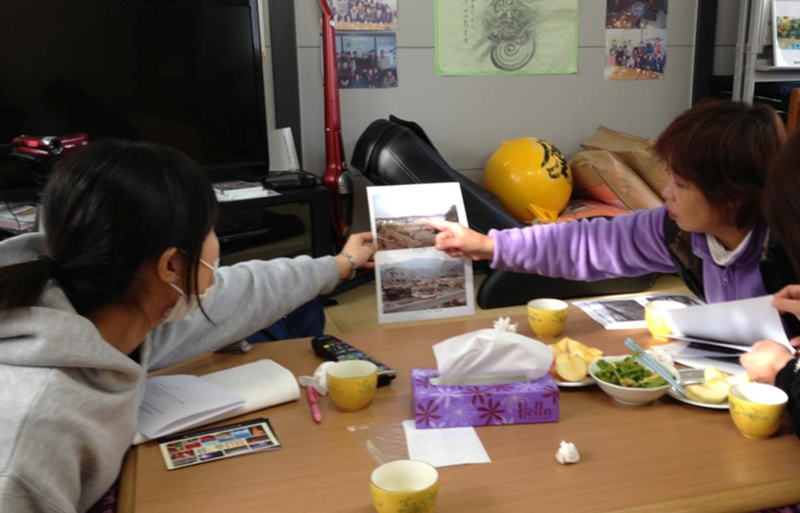 In the spring of 2011, students from Sophia University trucked up to Tohoku to volunteer, working wherever we were most needed until one day, upon seeing our cameras, an old woman in a Miyagi “temporary” housing unit invited a group of our students in because “she had something to tell us.” That “something” ended up lasting many hours over 3 days. She felt that her own government was not very interested in what she, or any local, had to say, and the mass media had already plotted their pre-set narratives. She, and hundreds of others, would rather we took time to record their stories than dig tsunami mud from their living rooms. While this was surprising at the time, it was something we were trained to do—oral narrative interviewing. From then, we began a new schedule: volunteer work in the morning, interviews in the afternoon, and usually nomikai drinking parties at night. Most of my students from Tokyo, not Tohoku. As such, they were enough “outsider” so that local residents wanted to tell them their stories. And when you’ve spent hours, days and weeks in a community doing volunteer work, it is much easier to generate the sort of goodwill and understanding that is so vital to good interviewing. The archive did not emerge until 2013, after we had been interviewing for almost two years, as we were trying to figure out what we would do with our interviews. In 2012, after an interview, we were told by one fisherman in Rikuzen Takata: “Don’t be like those other ‘researchers’ who just take our stories and disappear. 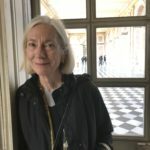 We are busy people; we are only telling you this so you will DO something with them.” This website is our effort to DO something that will be meaningful to the narrators, to share their stories with each other and with a wider audience. Our archive is characterized by not only its scope but also by its diversity. Some narrators start their story on the ‘day of,’ (あの日), as a point of references from which they then move backwards and forwards. (We never asked directly about that day until they brought it up—sometimes it is as important to find ways to forget as it is to remember.) Others start speaking as representatives of their community, offering up continually refined set pieces in ways that (we came to think) sought to reestablish some coherent and presentable face for both the individual as well as the community. There are many hopeful stories of heroic struggle in overcoming challenges, and there are just as many “crying stories” of pain and suffering—but it is almost always more complex than that. At times, the narrators are viciously critical of conceits and duplicity—of the State, of TEPCO (the electric company that runs the Fukushima reactors), or even their neighbors and themselves. Other times, our narrators were halting, feeling their way through a topic, talking to and for themselves as much as for us. An archive of scope, structured in a coherent fashion that enables efficient accessibility will outlive most journal articles or books. Moreover, this research model has also allowed us to more fully involve undergraduate students over an extended periods of time than I never imagined, and to collaborate with other researchers, communities, NPOs and social movements in ways that have created scholarly, political and civil potential, that we and others, are only beginning to appreciate and develop. 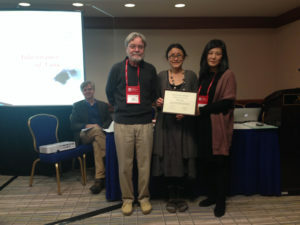 Sadly, we no longer have funding for Tohoku travel, but we are doing great oral narrative projects in Tokyo of anti-nuke movement, youth protests, irregular labor, homelessness and social justice issues. I am always only too happy to explain how we do what we do, and to collaborate on future projects with others. David H. Slater is the Director of the Institute of Comparative Culture, and professor of cultural anthropology in the Faculty of Liberal Arts and Graduate Program in Japanese Studies at Sophia University, Tokyo.